In America it seems as though Freedom, Liberty and the U.S. Economy are all having a near-death experience. As a result, many have begun a historic withdrawal march - withdrawing their resources, time and talent from a political and economic system which they feel is headed in the wrong direction. The federal government appears bent on spending our nation into oblivion - taking with it your savings, retirement nest egg and your privacy - unless prudent citizens take specific steps of financial preparation. The Great Withdrawal explains why America's future is clearly reflected in Detroit's 2013 bankruptcy. One by one, authors Craig Smith and Lowell Ponte, peel away the layers of the 100-year old attempt by Progressive politicians to hijack the heart, mind, soul (and wallet) of every American citizen. If financial freedom and liberty are to be reborn in our great nation, it will require taking wise action now! 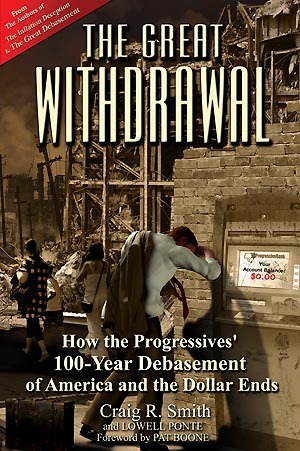 Call 800-289-2646 or register for a FREE copy of The Great Withdrawal!